Well been an unusually hot summer so far, with temperatures reaching into the high 90s F. In 14 years I haven’t seen it this hot. Gardens though are growing leaps an bounds with fresh veggies on the table every day. Actually it is the best garden I have had since moving here. I took a picture which shows how it is coming along. 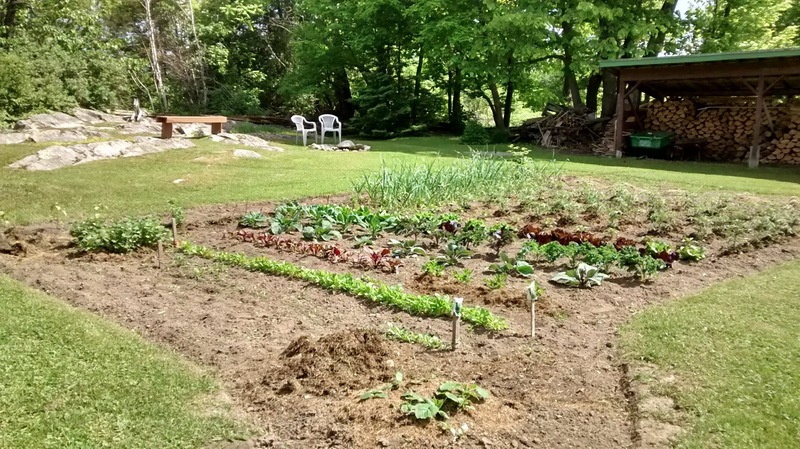 A garden this size will feed a family of six or more all summer long. For more information Click On Weather Station. Tarragon helps your body make red blood cells, which are, in turn, responsible for moving oxygen around in your body. Which I found helps in the prevention of cancer and many other diseases. The way it works is, lets take cancer; tarragon is a sweet tasting plant with a distinctive flavor of licorice. When cancer cells find the sweetness of tarragon it gobbles it up so to speak. In doing so the oxygen is taken into the cancer cells, and they are disintegrated, Leaving the healthy cells to do what they are suppose to do, and gain strength. You don’t need a whole lot, a 1/4 teaspoon mixed in with a few pieces tomatoes is all that is needed. Once a day. Or you can simply snip off a leaf or two from you garden, as it is easy to grow, and eat it. Can’t get much better, or easier than that. With tomato season almost upon us you are about to enjoy a treat. Some say they can’t eat tomatoes which in some cases is true. I found though that tomatoes are delicious, either raw or cooked. Actually cooked tomatoes have benefits that most don’t know about. It’s all about the lycopene – the antioxidant that causes the red color of tomatoes – a powerful antioxidant known for preventing the formation of certain cancers like prostate cancer and breast cancer. They also lower your risk of heart disease and are naturally anti-inflammatory. The secret to getting the full benefits of tomatoes lies in the preparation. Lycopene is released when tomatoes are cooked. In fact, preserved tomatoes if organic have even higher concentrations of lycopene than fresh. Myself I can’t wait, . What better way to stay healthy than to walk out into the garden an pick a nice red tomato, set back with a touch of salt and take in what nature has to offer.